The University of Alabama is partnering with the city of Tuscaloosa to commemorate the city’s 200th birthday throughout the year. Founded on Dec. 13, 1819, Tuscaloosa has a long history of being a dynamic hub of industry, commerce, health care and education. Known as the Druid City, Tuscaloosa is sharing its bicentennial year with the state of Alabama. In fact, Tuscaloosa was founded one day before Alabama was granted statehood on Dec. 14, 1819. 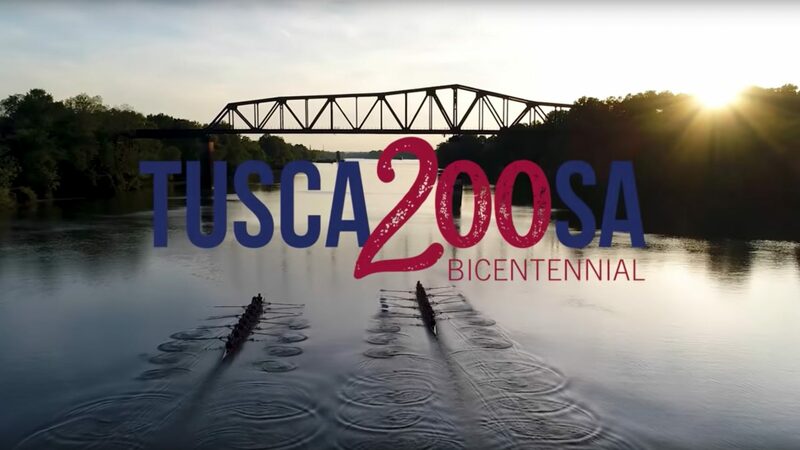 The Tuscaloosa 200 Bicentennial Launch Ceremony on Jan. 31 was the official kickoff of the yearlong celebration. UA’s Division of Strategic Communications produced an in-depth video that debuted at the launch ceremony highlighting the city’s history. As one of the University’s bicentennial gifts to the community, the video will be made available to clubs, civic organizations and other groups. The video features prominent figures in UA history who helped write significant chapters in West Alabama history. The piece will air regularly on the city’s government television channel. UA’s Osher Lifelong Learning Institute will sponsor numerous classes on an array of topics from the history of Alabama’s politics, to Alabama’s military influence and the journey to statehood. The OLLI-sponsored bicentennial programs are free to the public and will take place in Tuscaloosa, Birmingham, Gadsden and Greensboro, and in Pickens County. Registration is not required. Those interested should visit www.olli.ua.edu or call the OLLI office at 205-348-6482. The Bryant Conference Center will be home to a four-day history expo, “Tuscaloosa Through Time,” April 24-27. Every school in the city – public, private and parochial – is at work now, creating an innovative exhibit that spotlights an era of Tuscaloosa’s history. Every student in the city will have an opportunity to visit the expo, which will also be open to the public on Saturday, April 27. The long list of UA bicentennial collaborations also includes a community musical event at the Moody Music Building on Thursday, Dec. 12, and the unveiling of a bicentennial sculpture at Manderson Landing on Friday, Dec. 13. To learn more about Tuscaloosa’s history and for more information on bicentennial events, visit www.tuscaloosa200.com.